Design and manufacturing seem to get most of the attention where many product development processes are concerned, and for the most part, relatively little attention seems to be paid to the materials that will comprise these great new products. That’s about to change a little bit, though, with Dassault Systèmes collaborating with Granta Design to help product development teams make better decisions about the materials they use for the products they are developing. Through this new partnership, Dassault Systèmes’ 3DEXPERIENCE platform will integrate with Granta Design’s GRANTA MI system for materials information management, improving productivity, collaboration, and product quality. When it comes to product manufacturing, consumers have zero tolerance for errors, and even less when it comes to vehicles. As we enter into a new generation of vehicle R&D with connected and autonomous cars, these expectations will only increase. What will this mean for automotive manufacturers and how will it change the traditional design and development processes? Enter 3D modeling, simulation, and virtual reality (VR), things that Dassault Systemes knows something about. Two announcements made recently by Groupe Renault and PSA Group demonstrate how Dassault Systèmes’ 3DEXPERIENCE platform is helping car companies to use several 3D technologies to design, create, and visualize innovative transportation products, including autonomous vehicles, to meet the demand of their customers with what it calls its Target Zero Defect platform. The transportation and mobility industries are continually impacted by broad social and economic trends. Concern for the environment is currently the top influencer. The push for improved fuel efficiency has received unprecedented attention, with government agencies worldwide imposing increasingly strict regulations. Environmental friendliness has also become a purchasing concern of consumers, who also demand the same web connectivity and entertainment options they experience at home and on their mobile devices. And then there’s connected/autonomous/driverless vehicles. Dassault Systèmes is responding to these business and technical challenges with its Transportation and Mobility Industry Solution Experiences. The “Target Zero Defect” Experience builds upon the 3DEXPERIENCE platform with a series of industry-tailored process modules that empower users with the tools needed to address many industry concerns. For customers in the transportation and mobility industry these modules can help initiate the product development process flow using company-established knowledge and best practices that ensure and sustain competitive advantage. Through the full cycle of development from conceptual engineering to component design, manufacturing, and final assembly, the Dassault Systèmes industry process modules are designed to allow users to target zero defects in product delivery. We just returned from Dassault Systemes 3DEXPERIENCE Forum North America in Las Vegas this week. Truth be told, Las Vegas is not one of my favorite destinations, but I was intrigued by what I might discover about Dassault’s elusive 3DEXPERIENCE, something I’ve always had difficulty getting my head wrapped around. I came to Las Vegas hoping to finally understand what the 3DEXPERIENCE platform was about, also hoping the Forum would provide that opportunity. After learning all I could at the Forum, I now realize that the 3DEXPERIENCE platform is a comprehensive engineering and business platform, each dependent on the other and not mutually exclusive. On many different levels and in many different contexts, the Forum was all about experience, experience, and experience. Design and engineering definitely took a back seat at this event. This is a departure from competing engineering software companies where it’s all about products and subscriptions. Keep in mind, though, that the Forum was geared primarily toward big companies with current and prospective customers at the CxO level. This being the case, most of the presentations were high level and emphasized business potential over technology implementation. Technology was presented in the context of strategy, experience, and culture; not as an end in itself. That’s quite a broad range of markets that are served, and DS has strategically entered these markets through organic in-house development, as well as through acquisitions. 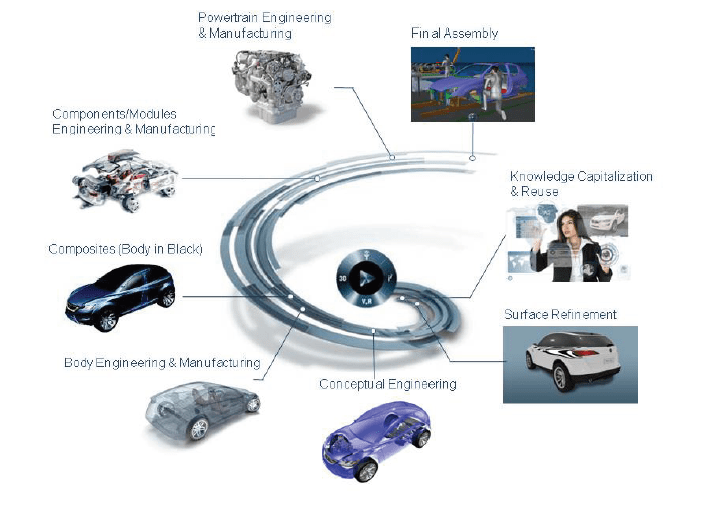 Below is the 3DEXPERIENCE compass with brief descriptions of its various points of reference and components. In DS’s view, consumers do not just buy products anymore, but rather, experiences. During the Forum, DS used Apple as an analogy to reinforce this thought on customer experience. Apple sells both products and supporting services that equate to an overall experience for customers – Macs, iPhones, iPads, iTunes, Genius Bar, etc. It seems like DS aspires to do the same. I guess it’s just me, but I’m still trying to get used to Dassault calling itself the 3DEXPERIENCE Company with a 3DEXPERIENCE Platform that consists of all of of its product lines. To its credit, though, Dassault recently announced a tangible result with Tata Technologies’ use of its 3DEXPERIENCE platform, based on V6 technology, for developing the small urban electric vehicle study – the eMO (for electric MObility). The eMO study was undertaken to demonstrate the feasibility of developing an electric vehicle at an affordable price. Tata Technologies says that the 3DEXPERIENCE Platform enabled its team to complete the project quickly and accurately. A significant challenge in the development process was the requirement to fit all the required vehicle systems into a small footprint while maintaining spacious seating for four adults. To achieve this, Tata Technologies used CATIA and ENOVIA to develop various studies, allowing global collaboration to rapidly evaluate and optimize possible solutions. The development of the eMO was a global effort, requiring collaboration among more than 300 Tata Technologies engineers from the U.S., Europe, and India. The data generated by the 3DEXPERIENCE Platform became the common language for collaboration and allowed rapid comparison of proposals, leading to swift decisions and innovative solutions. In addition, it allowed more time for testing of different design features aimed at reducing energy consumption, such as vehicle weight, rolling resistance and aerodynamics. Not a lot of details were given, which is sort of understandable for a feasibility study, but is tangible proof that Dassault’s 3DEXPERIENCE Platform is being used for real work. It will be interesting to see how eMO evolves and where it goes.